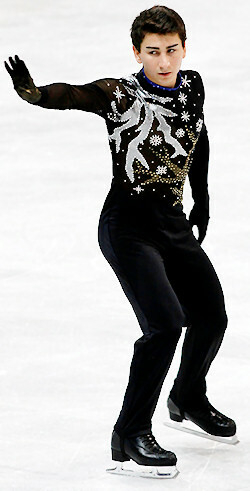 Max Aaron performs his long program at the 2011 World Junior Figure Skating Championships. For Max Aaron, the 2010-11 season may well be the turning point in his young skating career. After battling a potentially career-ending injury just two seasons ago, the 19-year-old is starting to hit his competitive stride. With a full season on international competition under his belt for the first time, Aaron is starting to fit in with some of the world’s best competitors, and his record is beginning to show it. Aaron began his skating career at the tender age of four when his mother signed him up to play hockey. Five years later and due to the absence of opportunities to play hockey in the summer, Aaron laced up figure skates for the first time. For the next seven years he balanced the two sports, standing out in both. Aaron was one of 40 kids to make the USA hockey development team in 2007 and lead his league in goals and penalties for two years. “I was always in the box,” he said sheepishly. Additionally, Aaron scored the winning goal in the International Bantam Christmas Tournament in Burnaby, B.C., Canada, in 2006. It was the first time that an American team won the tournament. The injury was a wake up call from his body that told him that he could no longer train two sports with such rigor. Aaron remembers that his grandfather was paramount in helping him make a decision about the crossroads in his athletic career. At the time of the injury, Aaron had already competed at the US Championships twice—finishing in 5th place on the novice level in 2006 and 13th on the junior level in 2007. Aaron returned to the ice about a week before the 2009 Midwestern Sectionals in an effort to qualify for the national championships. Once he returned to the ice to train on a regular basis, Aaron made the decision to relocate from the Alltell Ice Den in Scottsdale, Ariz., to train at the World Arena in Colorado Springs, Colo.
Aaron selected Tom Zakrajsek as his head coach, and has a large support team in Colorado Springs to assist with his training and development. After losing what amounted to a year of training and competition time, Aaron began the long process of returning to peak shape so that he could once again be competitive on the national scene. In the fall of 2009, Aaron finished in 2nd place at the Midwestern Sectionals earning a place in the junior men’s competition at the 2010 US Championships where he ultimately won the bronze medal. As a result of his bronze medal, Aaron was assigned to the first international competition of his career, the Gardena Spring Trophy in Val Gardena, Italy. He earned the silver medal. Last fall, with a year of skating post-injury under his belt, Aaron was given another international competitive opportunity, and was assigned to his first Junior Grand Prix event in Courchevel, France. With strong performances in both the short and free programs, Aaron was awarded the bronze medal. The cowbell and medal were enough to earn Aaron another chance to compete on the circuit, and he found his way to the SBC Cup in Karuizawa, Japan, a few weeks later. This time, Aaron won the short program and finished with the silver medal overall, and earned a spot in the eight-man Junior Grand Prix Final last December. At the Final in Beijing, China, Aaron nearly landed on the podium for a third time, but instead settled for 4th place. The trip to the Final earned Aaron a bye to the 2011 US Championships in Greensboro, N.C., where he captured the junior men’s title by more than seven points over the silver medalist, Alexander Zahradnicek. The championships were a big week for Aaron, but also for his family. His younger sister Madeline won the novice pairs title with her partner Max Settlage a day prior to his own victory, and his older sister Molly finished in 11th place in senior pairs to close out the week for the family. After nationals, Aaron immediately began preparing to compete in the World Junior Championships in March, in Gangneung, South Korea. With steady performances, Aaron closed out his 2010-11 campaign with a fifth place finish, and helped Team USA to secure three spots to compete at next year’s championships. As he looks to the future, Aaron will be making some major changes to his life both on and off the ice. Coach Zakrajsek believes that Aaron has many of the qualities that will allow him to transition into the senior level rather easily. Though he does not know what the fall season holds in store for him, Aaron has already set some ambitious goals for himself. Off ice, Aaron is planning to start taking college courses at the University of Colorado in Colorado Springs, and is considering a major in business. Aaron’s father is a pediatrician based in Arizona, and his mother commutes between their home in Arizona and the Aaron’s training base in Colorado Springs. Older sister Molly has retired from competitive skating, and has moved back to Arizona where she will be a freshman at Arizona State University. Aaron and younger sister Madeline remain in Colorado to continue training. Outside of skating, Aaron likes to swim, hang out with fiends, golf, and of course, play pick up hockey.